Show that your love will last forever! Umbrella in heart shape - this unique bridal umbrella will be the eyecatcher of your wedding! It features an elegant forever love" print. The light colored handle and ribs make for a bright experience. It's extra wide span provides enough room for 2 people and makes it ideal for the bridal couple. Available in white or ivory to perfectly match the color of your wedding dress. 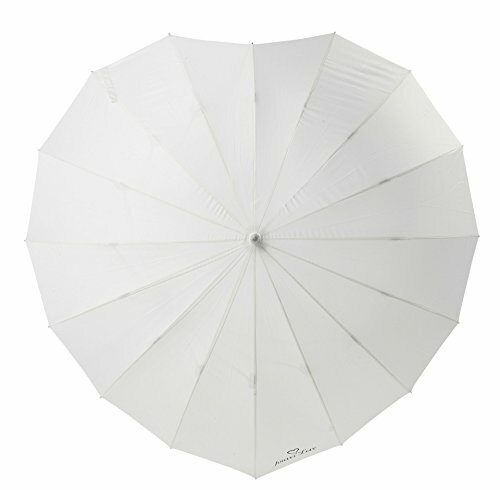 With this beautiful wedding umbrella you will be prepared for rainy weather or to cover from the sun. Great for a unique wedding photo of the bride and groom, wedding photo backdrop or Thank You notes photo prop. Also a unique wedding gift to the newlyweds or at a bridal shower. For everyone who loves an elegant accessory with usefulness. Total length: approx. 42 inches. Opens manually. Extra wide span to fit 2 people - Ideal for the bridal couple! If you have any questions about this product by The Stunning Bride, contact us by completing and submitting the form below. If you are looking for a specif part number, please include it with your message.